La Farge Oval Ceiling- Large ceiling panel set (3). Beveled Glass French Door Windows- Double door (French) entry with beveled glass. Art Deco Shells- Bath window. Arch Edwardian Style- Private residence. Flamingo Panel- Local beach community installation. 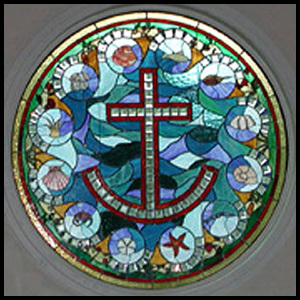 Woodbridge Funeral Home- Nondenominational funeral services chapel window. Frank Lloyd Wright Lamp- Custom lamp shade. Warrior Painted Restoration- Kiln fired and sandblasted restoration processes. Hummingbirds Entry Door- Custom panel set for solid oak doorway. Lighthouse & Tall Ship- Local residence, Eatons Neck, LI. Berryman Violin- Dining room panel. Compass Rose Panel- Beach residence, North Carolina. Seascape 2 Boats- Clients boats in glass. Cherry Point Military Base- USMC Chapel windows. Northport Fish and Lobster- Entry door to fish market. 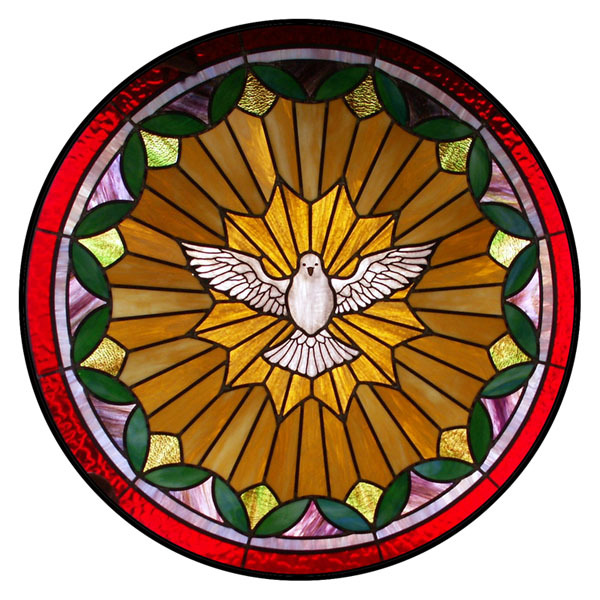 Oscars Mortuary "Dove" Panel- Three doves in 16 panel layout. Egret Panel- Water community installation. Fireplace Screen- Custom glass and hand forged frame. St. Francis by the Sea- Seaside house of worship. North Carolina. Beveled Glass Sidelites- Local residence. Heron- River front private residence. 24" Compass Rose- School auction panels. Jesters- Door panel with initial "G". 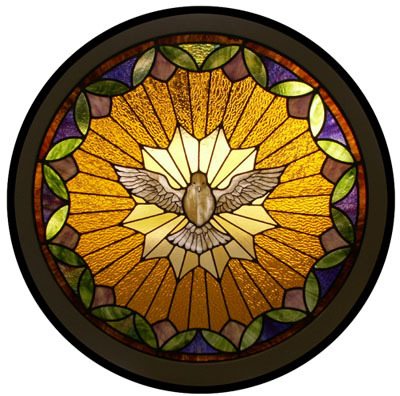 Holy Spirit Oval- A gift rendered from the Basilica Holy Spirit. St. Peter the Fisherman- Oriental, NC. Compass Rose Transom- Local residence. Edwardian Rose- Kitchen divider window. All Saints Parish- Pawley's Island, SC. Bethany Christian Church- Arapahoe, NC. Institute Methodist- 47" Circle Holy Spirit. Celtic Transom- Local transom panel. Alpha Omega Symbol- Gift for Hilda. Prairie Entry- Custom leaded glass panels made for an entry. Local residence. Tiffany Peacock Bath- Bathroom remodel with new stained glass. Good Shepherd Catholic Church- Front entryway. McCormick, SC. St. Clair's Church of Christ- 3 crosses & Communion, Bath, NC. St. Paul AME- Lightbox installation. Snug Harbor on Nelson Bay- Lounge panel. Sea Level, NC. Fleur di Lis- Front Door Panel Set. Lassiter Heron- Ornamental tropical themed stained glass panel. Wine Cellar Door- Panel with a cluster of grapes. Custom stained glass & contract work available.